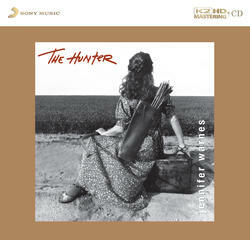 "The Hunter" was released 5 years after her breakthrough with "Famous Blue Raincoat". A Top 100 LP when first released in 1992, The Hunter's audiophile credibility is best summed up by Elliot Scheiner's Grammy nominated recording and mix. It contains the charting single "Rock You Gently," a sonically dense yet expansive cover of The Waterboy's classic "The Whole Of The Moon," a soulful Jennifer Warnes/Leonard Cohen composition "Way Down Deep," Todd Rundgren's "Pretending To Care" and even a Donald Fagen tune ("Big Noise, New York"). She owns every tune here, backed by a-list session players who ground the songs with solid and unobtrusive authority, letting Jennifer's peerless interpretive skills bring the soul of every lyric to the forefront. Ms. Warnes uses her voice to serve the lyric and this allows the song to return the favor. This recording has been mastered by the K2 HD format of 24-bit 100kHz, which creates an unbelievable sound surpassing other formats. This K2 HD Mastering CD will play on all CD players.